The protest comes amid a wave of impassioned calls for gun reform, many of them led by young people. Washington: A group of teens and more than a hundred supporters staged a "lie-in" outside the White House on Presidents Day to pressurise lawmakers to pass tougher gun laws, the media reported. 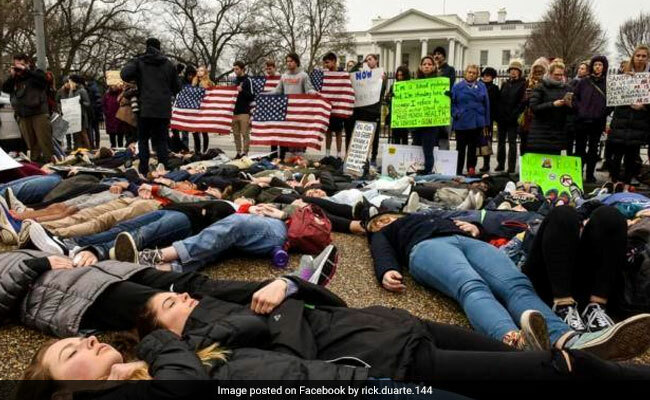 The group, dubbed Teens for Gun Reform, had started organising the event by seeking 17 demonstrators to lie down for three minutes to symbolise how long it took for Nikolas Cruz to gun down 17 students and teachers at Marjory Stoneman Douglas High School in Florida last week, reports CNN. "The two of us have organised this protest in solidarity with all of those who were affected by the tragic school shooting in Florida last week," Eleanor Nuechterlein and Whitney Bowen, the teen organisers, said in a statement on Monday. "We call on our national and state legislatures to finally act responsibly and reduce the number of these tragic incidents. It's essential that we all feel safe in our classrooms." Representative Don Beyer, a Virginia Democrat and a proponent of gun control, was among those who attended the event, reports CNN. "I was very proud of them," Mr Beyer said. "The ground was cold and wet. This is a holiday. But, yeah, they're being politically active. "Historically, it's the old people that participate in the elections and do all the volunteering, so this was great... And hopefully it portends a sea change in our attitude toward gun safety legislation." Monday's protest came amid a wave of impassioned calls for gun reform, many of them led by young people.